Adapted from Vegetarian Table : North Africa by Kitty Morse. Spicy without being hot, exotic without using hard-to-find ingredients, Khalota (pronounced Ha-Lo-Ta) is a delicious introduction to North African cooking. In a large non-stick saucepan over medium-high heat, dry-fry the onion, stirring constantly, until it is tender and slightly browned, about 5 minutes. Add the paprika, three-fourths of the minced garlic, the parsley, and 1 tablespoon water. Stir well. Add the carrots, potatoes, and broth. Cover and cook until the carrots lose their crispness, 8-10 minutes. 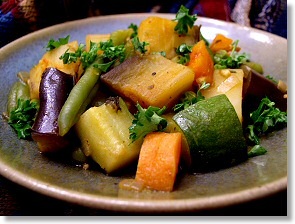 Reduce the heat to medium-low and add the zucchini, eggplant, green beans, and fava or lima beans. Cover and cook until all the vegetables are tender, 25 to 30 minutes. Season with salt (if using), pepper, and cayenne to taste. Sprinkle with the minced parsley and remaining minced garlic and serve immediately.